Well, we had thunderstorms yesterday and since then a steady drizzle which is supposed to continue until tomorrow morning. My new sock arrived as well. 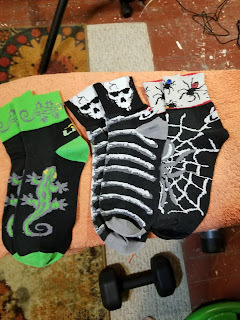 I bought them, not because of the skull or the spider, for the gecko. Snazzy, huh? Big Seig likes them too. He thought they were a toy and I had to chase him down the hall to get them out of his mouth. I also got a 10 mile ride in this morning. Place was called Fallonica - which is in Italy. The Amgen Tour of California starts today. As the years pass, this race becomes more and more prestigious. We are seeing more AAA team riders, which is a very good thing. As with The Tour Down Under, cycling is becoming a truly international sport. Teams are realizing there are fans everywhere. Minor teams that never got a word of press have riders competing along side riders who have climbed on to the podiums of the Tour de France. This is really amazing. Oh, and I saw that someone named Mulvaney said the White House didn't need to apologize for that... "joke" since it was made at a private meeting. Well, if that demonstration of ignorance became public than that meeting wasn't too private, now was it? Without an apology we can only believe that "jokes' of this type are rather prevalent in the Idiot Jerk's administration. This is, however, the type of trash behavior we're all coming to expect from the Idiot Jerk and those surrounding him. Oh, and it's Mother's Day. My sister called me yesterday. She'd taken a present to our Mom and everything was fine... until my Mom called her later in the day, most likely to thank her again. However, she ended up rambling incoherently for about fifteen minutes, not angry, just moving farther into her dementia. She did the same thing when I visited her on Wednesday, tying bits of pieces of different memories together, all of which centered around my great grandmother climbing onto a kitchen sink to pee in it. My sister was distressed. So I told her there was not much we can do. Everything is disassembling. Sometimes this is how things end. can we put every GOPrick in murrica in a ship and sink it far far away? LOVE THE SOX! I can see why seig wants to play with them! I've met Mick Mulvaney--he's from South Carolina. I don't get why such a nice man in person is such a douche in the White House and covering for those asshats. Unfortunately, a lot of politicians come across as very nice people in person, which is why they're politicians.